I had the privilege to meet up with a few other photographers to shoot a group of Traceurs performing parkour moves. I hadn't even heard of parkour before I was introduced to this local group though I've seen it in movies, I didn't know it had a name. 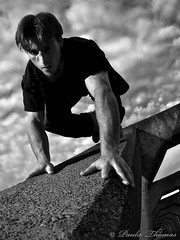 According to Wikipedia, parkour is the aim of moving from one point to another as smoothly, efficiently and quickly as possible using principally the abilities of the human body, but is also built on a philosophical premise, perhaps more similar to martial arts than to a sport such as gymnastics. This shot of Tyson is my favorite shot of the bunch. I used one off camera flash for all my shots. Some were shot through an umbrella when it started getting darker. I posted a behind the scenes shot too. We met up at Gasworks on a Monday evening. They brought a few kids for us to shoot as well, but I didn't get very many of them. We split up into two groups and I think Paul Swortz got more pics of the kids, but haven't seen his pics yet. They sure start training them young. I hope their parents are ok with them doing this stuff. It can be a dangerous sport. There was much crawling, swinging, jumping and hanging. I got most of the shots I wanted to get and am pretty happy with the way they turned out. WOW! Love this! Great framing!